Fresh cut Southern pine lumber from a sawmill is green. The green lumber must be stacked in a certain order to dry the lumber properly. Southern pine lumber not stacked and dried properly will grow mold and warp. Left unattended, in an improperly stacked pile, the fresh Southern pine lumber will begin to rot in a few months. Once properly dried, Southern pine lumber is strong, attractive and ready for installation. Drying times for stacked Southern pine depend on environmental conditions. In most cases, nine months must pass before using the lumber. Set the four concrete blocks on a firm and level surface in a square 4 feet by 4 feet. Place the two 4-by-4-by-8-foot long posts parallel to each other on the concrete blocks. Allow 2 feet of the horizontal posts to overhang the blocks on each end. Begin stacking the green Southern pine boards on top of and across the horizontal posts. Keep identical thickness boards in a single layer. Do not mix different thicknesses in a layer. Leave a 1-inch air space between each board. Continue stacking the single layer of boards to the end of the horizontal post. The length of the first stack layer is approximately 8 feet long. Arrange the 1-by-1-by-8-foot furring strips on top of the first layer. Place the first furring strip across the layer of boards 2 inches from the end. Set subsequent furring strips one foot on center across the boards until you reach the other end. Set the last furring strip 2 inches from the other end of the boards. You must have nine furring strips evenly spaced down the first layer to properly support the next layer of boards. Stack the remaining Southern pine lumber in the same fashion. A layer of boards separated by the 1-inch thick furring strips. All board layers must have a 1-inch spacing between the edges. This allows for complete airflow around the boards. Cover the stack of drying boards with the dark color tarp. Weigh the tarp down with old boards or mis-cuts from the sawmill. Allow the edges of the tarp to blow in the breeze. In other words, do not weigh the edges of tarp down, which will retain moisture in the boards. All sawmill operations will provide you with furring strips at little cost, if you purchase the lumber from them. They want your continued business. The lower layers of the lumber should be the thinnest boards: 1/2-, 3/4- and 1-inch thick boards. Keep thicker dimension lumber, 2 inches thick and larger, near the top. The weight of the heavier boards prevents the thinner boards from warping. You can stack the Southern yellow pine indoors such as a garage. In cases where air movement is restricted from the drying lumber, place a household box fan at the end of the drying stack of lumber. Elevate the fan so it blows through the stack at mid-height. Operate the fan during the day to move air through the stack. If possible keep the garage door open when the fan is in operation. 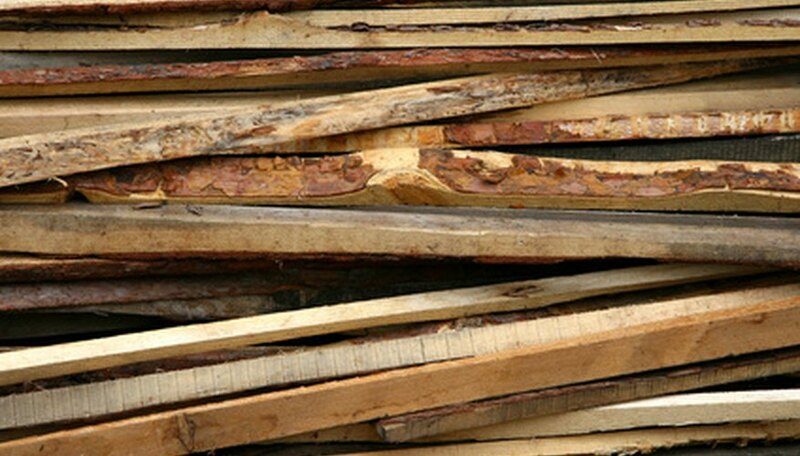 When stacking lumber outdoors, keep the stack covered to prevent discoloration from the sun. Exercise caution for the height of the stack. Do not exceed 8 feet in overall height as the stack may weaken and fall.